The winner of this year’s Amateur Championship will come from either the UK or France after players from the two countries dominated the third round at Carnoustie in Angus. Four Frenchman and four Brits will contest the quarter finals tomorrow morning, and there’s certain to be two men from the UK and two from France in the semi finals. That’s because the first quarter final will be contested between Alexandre Daydou and Antoine Rozner of France, the second between Greig Marchbank and Grant Forrest of Scotland, the third between Scotland’s Jack McDonald and Sean Towndrow of England, and the fourth between the French pair of Romain Langasque and Robin Sciot-Siegrist. In this afternoon’s third round two Scotsmen delivered the most emphatic victories. Jack McDonald of Kilmarnock Barassie saw off his countryman Robert MacIntyre from Glencruitten by 4&3 while Grant Forrest of Cragielaw defeated England’s Ashley Chesters, out of Hawkstone Park, by the same score. Another Scot, Greig Marchbank of Thornhill, saw off Miki Kuronen of Finland to ensure there would be three home players in the last eight. Sean Towndrow of Southport & Ainsdale will be the only English representative in the quarter-finals. He produced a battling performance to get past Poland’s Mateusz Gradecki. After seven holes Towndrow went three down, but he fought back to square the match by the 15th. A bogey by Gradecki on the 16th saw the Englishman take the lead for the first time, and he held firm with two pars to close out the victory. In the top two matches of the third round, Alexandre Daydou of France never looked in significant danger against Andri Bjornsson of Iceland, winning by 2&1. Antoine Rozner, also of France, enjoyed a relatively comfortable passage into the quarter finals with a 3&2 win over his countryman Paul Barjon. In the seventh match on course, Romaine Langasque came through a ding-dong battle against Adam Blomme of Sweden while Robin Sciot-Siegrist had to come from behind to see off Latin America Amateur Championship runner-up Alejandro Tosti. 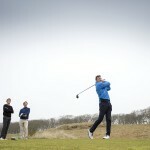 The first quarter final match will tee off at 8.15 tomorrow morning, with the semi finals to follow in the afternoon.